The Prespes Agreement was ratified by the Greek parliament on Friday with a majority of 153 votes, with 146 voting against and one deputy abstaining with a vote of 'present'. parliamentary group of 145 MPs, as well as the MPs Elena Kountoura, Katerina Papakosta, Thanassis Papachristopoulos, Stavros Theodorakis, Spyros Lykoudis, Giorgos Mavrotas, Thanassis Theocharopoulos and Spyros Danellis. Votes against were cast by main opposition New Democracy, Democratic Alliance, Communist Party of Greece, Independent Greeks, Centrists' Union and independents. The MP Grigoris Psarianos abstained, casting a vote of 'present'. Vassilis Kokkalis, who is a member of the government, voted against the agreement. The foreign ministry's draft bill for the ratification of the agreement was passed in a roll-call vote requested by Parliament President Nikos Voutsis. The vote was held after three days of discussion in the plenary and two in the Standing Committee for Foreign Affairs and National Defence in order to allow all MPs to address the house. According to Voutsis, the discussion lasted 38.5 hours with addresses by a total of 200 MPs, including political party leaders etc. "Today is a historic day for Greece," Prime Minister Alexis Tsipras said in statements made in the entrance of parliament on Friday, after the vote for the ratification of the Prespes Agreement to end the FYROM name dispute. The day was historic for Greece because it ended a major outstanding issue that had burdened the country's foreign policy, the prime minister said. "We are protecting an important part of our history, the heritage of ancient Greek Macedonia," Tsipras noted. "At the same time, it is a historic day for the Balkans with their long history of conflicts, disputes and nationalist hatred. We are turning a page and giving space to peace, cooperation, friendship, solidarity and mutual understanding," Tsipras said. 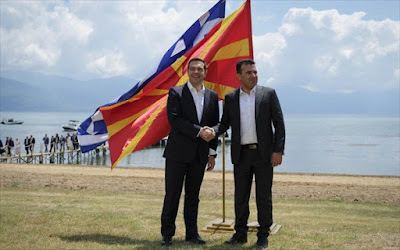 Former Yugoslav Republic of Macedonia (FYROM) Prime Minister Zoran Zaev, in a twitter message posted on Friday, hailed as a "historic victory" the ratification by the Greek parliament of the Prespes Agreement, which will change the name of his country to North Macedonia and bring a long-standing diplomatic dispute between the two countries to a close. "Congratulations my friend @tsipras_eu," Zaev wrote, addressing Alexis Tsipras, "together with our peoples we reached a historic victory. 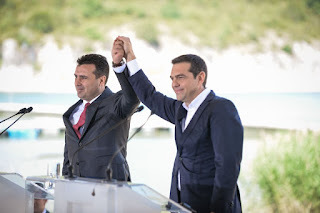 Long live the Prespa Agreement! For eternal peace and progress of the Balkans and in Europe!" Zaev wrote.